Everything we prepare is made from scratch. Our portions are generous, our sauces are rich and thick, and our pizza dough is made fresh daily. 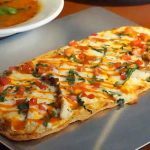 We invite you to create your own pizza, or enjoy one of our house favorites. Pepperoni, sausage, green peppers, mushrooms, & ground beef. Pepperoni, sausage, Canadian bacon, onions & black olives. 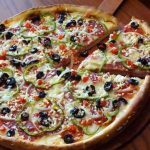 Pepperoni, green peppers, onions, tomato slices, salami, feta, & black olives. Pepperoni, sausage, ham, onions, green peppers, mushrooms, black olives & ground beef. Alfredo sauce Ricotta blend, chicken, spinach, tomato slices, garlic & feta. Pepperoni, sausage, ham, Canadian bacon, & ground beef. Canadian bacon, green peppers, mushrooms, & pineapple. Onions, green peppers, mushrooms, diced tomatoes, & zucchini.